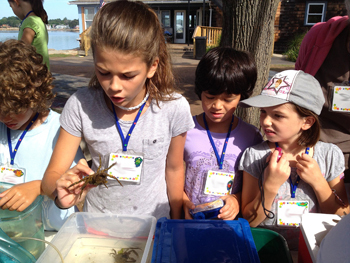 The Branford Land Trust is pleased to announce the 20th Annual Hands-on Environmental Day Camp. Children ages 5-9 will enjoy hands-on activities, including touch tanks, woodland and Long Island Sound exploration, live bird program with A Place Called Hope, interactive sea shantie music, a program by Curious Creatures, nature crafts, and more. The day will run from approximately 9:00 a.m. to 4:00 p.m. A full day’s agenda, map, and list of what to bring will be mailed upon receipt of your registration and payment of $45.00 (additional children, same family $35.00), or $35 for Land Trust members. Scholarships available. Registration deadline is Monday, July 20, 2015. Click here to download a registration form. For further information contact Martha Rice at 203-314-7128 or mhbrice@gmail.com.